Isobella Cottrell is taking advantage of the This Girl Can Coach programme being run by Coaching Derbyshire to supplement her skills in a hope to pursue a career in PE teaching in the future. 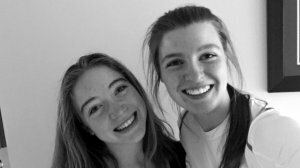 The 17-year-old, currently studying A levels in English Language, Psychology and Sports Studies at Lady Manners School in Bakewell, lives in in Chesterfield, but does most of her coaching in the Derbyshire Dales. "I first got into coaching through helping out at school with extra-curricular activities. I then completed my level 2 sports leadership award and am currently completing my level 3. "I was inspired by the fantastic PE department at our school and coaching was something which caught my passion. I have been coaching and helping out for two years now. Watch Isobella speak about her learning experience at the 2016 Derbyshire Sport Coaches' Conference. "I have coached at school in various different activities (such as dance, fitness and netball with netball being my main sport) as I help out in PE and Games lessons three times a week and also run a session for SEN students. "It involves me creating lessons for them that allows them to access physical education in a safe and fun environment. 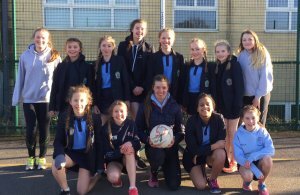 "I have coached the year 7 and 8 netball teams at school and assisted them in order to prepare them for their county tournaments. I also run extra-curricular clubs four times a week. Isobella has played netball among other sports alongside her coaching. "I have played sport throughout my life and have taken part in athletics, trampolining and netball competitively. "Through school I have competed at various different levels whether it be inter school, county, or regional standard. "Since coaching I have learnt how to be adaptable as sometimes what you've planned doesn't always work and you need to be quick thinking and make sure that your participants stay engaged. "I have learnt to think on my feet and trust my own ability that I do know what I'm doing. "It has also helped me to develop my communication and leadership skills further and also grow as a person. I have learnt how to effectively plan and deliver a session. "The best thing about being a coach is knowing that you are part of the wider gain. I love working with the girls within school knowing that I am helping them to become better at their sport. "Thanks to the amazing PE teachers at school who inspired me, I wanted to be able to pass on my positive experiences through my own coaching. "I love knowing that I am helping to provide something positive for the girls that take part in my sessions. 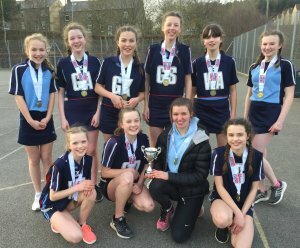 Isobella has helped the year 8 netball team take first place at a county tournament. "Coaches and volunteers are extremely important in sport and physical activity especially at grass roots level as without them there wouldn't be any training sessions or competitions. "They lay the foundations for many of the opportunities that are created within sport and sport wouldn't be able to function the way it does without the brilliant volunteers and coaches that we have within the community. "Personally, I have never had a problem with being a women and taking part in sport. I have never had a negative experience just because of my gender. "But I understand that it can happen and often in can be quite difficult to engage women and girls in sport due to barriers that society has created. "I think we should make it our overall aim as a modern society to do our upmost to ensure that everybody has equal opportunities within sports. Why should men and boys have more access to things that women and girls? "For those women and girls who have have never taken part in an activity or sport before but are thinking about trying it, then I would tell them to go for it as you never know until you try! Also there is a fantastic support network now, so there is always someone to talk to if you are concerned about anything." "The This Girl Can Coach Programme has helped me immensely as without this wonderful opportunity I would not have been able to complete my level 1 netball coaching course. "Not only has the funding benefited me, but I also feel it has given me a secure platform from which I can establish myself as a coach within the local area. "I am kept motivated by knowing that I am helping to implement something positive within my local community, if I can think that I have helped to positively influence people's lives then I am happy. "I am also kept motivated as I love sport myself as I have benefited greatly from taking part in it, so coaching gives me an opportunity to give something back. Isobella, with ball, and the year 7 netball team she coaches. 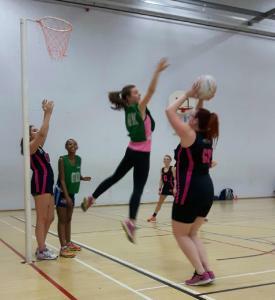 "In the future, I am hoping to complete my level 2 qualification for coaching netball. I am also hoping to complete more level one courses in various different sports. "Over the next year I will be taking part in the County Young Coaching Academy which I am really looking forward to. "I am then hoping to go onto university with the overall aim of becoming a PE teacher. I want to keep developing my knowledge and expanding my experience so that I can be the best version of myself that I can be as I have been thoroughly inspired by the people around me. "If you are thinking about coaching or volunteering then definitely get involved! It was one of the best decisions I ever made. "Knowing that I can use my skills and knowledge to deliver fun and engaging sessions to children and young people makes me extremely happy. "